Now, I know the Williams era isn’t everybody’s cup of tea and I’m always of the opinion that you can find something to cheer you in an under par story so I’m going to try and be as even handed as I can with the stories I'll review from the next few seasons. In my opinion the quality – whether that be production values, storytelling, acting etc – does go up and down rather dramatically in the Williams era but I’m trying to be fair where possible. Ok. So let’s get a positive in first. The plot not being one of them, I shall keep the summary brief and then move on. 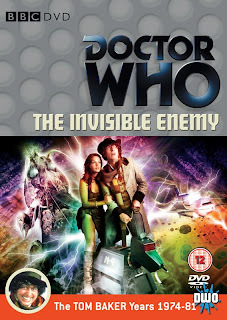 The Doctor and several humans become infected by a space borne virus. He and Leela travel to the Bi-Al Foundation in order to combat the virus nucleus. The opening episode is actually rather good in that it really shows off the work of the BBC Effects Unit under Ian Scoones. The shuttle sequences both in the asteroid field, being attacked by the virus and landing on Titan are excellent and there seems to have been a real effort here to raise the bar with this work. And you do have to bear in mind that when this was actually being made the production team wouldn’t have yet heard about a low budget science fiction film called ‘Star Wars’ despite received opinion that K9, the spaceships and the blaster battles were directly influenced by it. Williams just had his finger on the pulse as there’s a sense here that the programme begins its shift from adult/teen-orientated ‘monster’ stories to space fantasy aimed more at the kiddies. I’m not saying that some of the concepts and ideas that the show would go on to present are ‘childish’ in that sense but rather that the series throws off its reputation as a scare-fest entertainment and aims squarely for the younger members of the family audience – particularly those who would soon sign up for the ‘Star Wars’ bandwagon . I would say that at least Williams knew which way the wind was blowing and had the sense to recognise that and keep the ratings up and the popularity of the programme intact. Adults and teenagers might not have found much to divert them in the next few years but the kids did. This is symbolised here more than anything by the arrival of K9. However, his laudable ambitions were over-reaching and he was saddled with a smaller budget because of the hyper-inflation of the times. So things do often end up looking cheap and in the dawning days of ‘Star Wars’ using a vivid imagination does not necessarily equal small budgets and the lower expenditure would be felt more so after that film’s release. This story is problematic in that, whilst the effects are good, the sets often feel a bit shabby, particularly the Bi-Al sets and the new TARDIS console. It’s a shame as Williams was trying to ride not just on the wave of Star Wars and its ilk but also to tap into the burgeoning science fiction literary styles of Larry Niven and his contemporaries and certainly this particular story could have been inspired by the ‘hospital in space’ novels of James White. There is a genuine urgency to the first episode as the virus possesses the humans and the Doctor and efforts are made to defeat it. It does look moody on the Titan base, if a bit cramped, with some good studio lighting adding to the atmosphere. This completely dissipates once we’re off Titan and at the Bi-Al. For me personally, Doctor Who is at its best when there is total conviction behind it, even when it is at its most outlandish. My main problem with the last three episodes is that we see all attempts at conviction, building of tension and dramatic conflict being undermined by variable acting (sorry Frederick Jaeger but you were miles better as Sorenson in Planet Of Evil), unconvincing make-up that makes the virus’ victims look like they’re doing drag at La Cage Aux Folles and finally that Virus Nucleus shrimp/prawn disaster that makes Muffin The Mule look sophisticated. I know…I know there are other similar disasters in other eras but here I feel it is one element amongst many that send this into a spiral of the unconvincing. And we could get into a real mess when we look at the science of the story. The cloning of Leela and the Doctor is done so matter of factly and so amorally, knowing the clones only have a brief life, and the process even recreates their clothes and Leela’s accessories. It’s as bonkers as the Fantastic Voyage miniaturisation scenario. I know…I know, we usually forgive the programme its bad science as long as the rest of it is entirely engrossing. But this isn’t remotely in the same league as Talons or Ark In Space where we can forgive certain inadequacies because the rest of it is just so bloody good. A shame as there are some interesting ideas struggling to get house room - the notion of viruses becoming sentient prefiguring all the nasty computer viruses that our hard drives are attacked by these days. Viruses as ideas and languages that infect society can be seen in a bizarre echo of today’s radicalising of disaffected immigrants. A very Burroughs-like concept for a tea-time show. But for me it culminates in the sad feeling that in the end I don’t really care about the mad prawn thing threatening to dominate the universe and The Invisible Enemy gives us a future where nothing of interest seems to be going on. By the time the Doctor figures he’ll just blow the virus up, I was already thinking of what to have for my tea. From this moment on it seems that even the Doctor starts to care less about all the would-be conquerors of the cosmos and if he doesn’t give a sod, then why should I? He’s more interested in chess and painting, judging by some of the TARDIS scenes in this season. The regulars also don’t inspire much either. You’re really aware that Tom is no longer under the thumb of his previous producer and the new guy is more likely to indulge his ad-libs and tolerate his ambivalence towards the role at this time. He’s getting way too nonchalant about the things that matter to the hero of the show. And Leela is treated as a stupid thug and thus ends the really wonderful character development of the previous stories. And then there’s K9. I like the idea of K9 and the look of K9 but like most things in the Williams era it just hasn’t been thought out. We thus end up with a know it all computer on wheels that shoots people to order but can’t manage to get into and out of the TARDIS on a regular basis. He’s such a good idea that for most of the time he goes AWOL whilst the writers try to figure out what to do with him. Nice concept, shame about the realisation. Do I like The Invisible Enemy? Not really. A reasonably good first episode with some good effects work and then it all goes wrong. Baker and Martin try and throw lots of ideas at the wall and hope some of them stick so you end up with a rather schizophrenic story that can’t decide what it wants to say and a production that limps to the finishing line having fudged whatever dramatic tension there might have been.